INTEX 2800 GPH Above Ground Pool Sand Filter Pump and Above Ground Pool Vacuum. Part Number: 28647EG(56673EG) + 28001E. INTEX Krystal Clear 2800 GPH Above Ground Swimming Pool Sand Filter Pump - 28647EG(56673EG). Heavy duty 14 sand filter - requires approximately 55 LBS of sand (sand not included). Simple to use and easy to operate filter that will outperform your standard cartridge filters. Powerful 0.75 HP / 2,800 GPH keeps your water sparkling clean. Pump flow rate: 2,800 GPH. 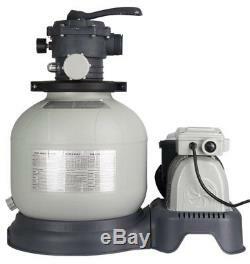 INTEX Krystal Clear 2800 GPH Above Ground Swimming Pool Sand Filter Pump - 28647EG (56673EG). Simple and easy to setup, the Intex 2800 GPH Sand Filter Pump Krystal Klear pool pump provides an eco-friendly and low-cost option for swimming pool filtration. With virtually no maintenance, your sand only needs replacement every five years. This sand filter from Intex features a powerful motor, 6-way valve, pressure gauge, a built-in timer, and a system flow rate of 2,150 GPH. This filter meets the UL standards, and it is an excellent upgrade to the filter cartridge system on your Intex Above Ground Swimming Pool (Easy Set, Metal Frame and Ultra Frame -- up to 12,800 gallons). Get ready for cool, clear water and less hassle for this season and years to come! 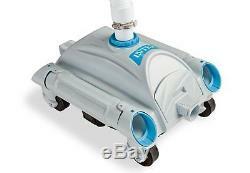 INTEX Automatic Above Ground Swimming Pool Vacuum - 28001E. Take the work out of cleaning your swimming pool this season with the Intex Automatic Pool Vacuum. Connect this automatic pool vacuum to your existing filter pump (1,200-3,500 GPH) and this little workhorse does the rest. Using venturi suction, this automatic pool vacuum will keep the bottom of your pool clear of leaves and other debris. Spend less time cleaning your pool and more time enjoying it with the Intex Krystal Clear Sand Filter Pump and Intex Automatic Pool Vacuum! System flow rate: 2,150 GPH. Easy operation 6-way valve makes maintenance easy, giving options to backwash, rinse, recirculate, drain, filter and close system. Strainer basket included on pump prolongs the life of the sand and is easy cleaning. Includes two 1.5 in connector hoses. Does NOT include plunger valves and 1.5 inlet/outlet fittings. Built-in 24 hour timer enables you to set automatic filtration times for the pool to save on daily maintenance. GFCI electrical protection, works with your standard 110-120V Outlet. Ideal for (but not at all limited to) Intex pools such as. Ultra Frame Rectangular 24' x 12. Wood Grain Frame 16'8. The newly designed Auto Pool Cleaner is a hassle-free solution as it effectively vacuums the entire pool floor automatically. For Intex pools with 1.5-inch hose fittings and. Attaches to inlet connector in the pool with a 24.6-inch hose. Requires filter pump with a flow rate between 1,200-3,500 GPH. Sand Filter Pump and Pool Vacuum. Intex is the world leader in both designing and producing high quality, innovative products for indoor and outdoor recreation. Select the reason for the return. This listing is currently undergoing maintenance, we apologise for any inconvenience caused. The item "INTEX 2800 GPH Above Ground Pool Sand Filter Pump and Above Ground Pool Vacuum" is in sale since Thursday, June 7, 2018. This item is in the category "Home & Garden\Yard, Garden & Outdoor Living\Pools & Spas\Pool Cleaning Tools\Other Pool Cleaning". The seller is "vminnovations" and is located in Lincoln, Nebraska.